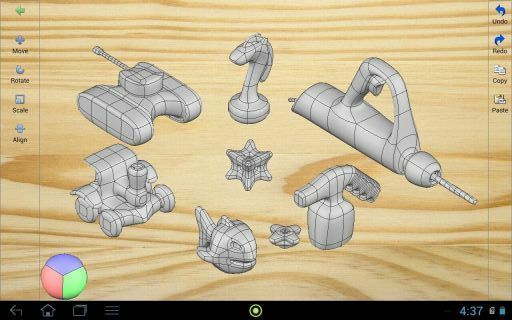 ASCON Group, developer and integrator of professional CAD/AEC/PLM solutions, is glad to present a new application for 3D modelling on mobile devices running the operating system Android. The add-on, called SubDivFormer, is available now free of charge through Google play store. A distinctive feature of the new tool - its versatility. SubDivFormer can be used both for engineering design and for children play. SubDivFormer is based on SubDivisionSurfase technology: model is described by a network of reference points, which can be approximated in a smooth shape algorithms. In a stage of working with a form there is no either body or surface, that provides easy and fast transformation (as only points are moving). The work with SubDivFormer requires a device running Android version 2.3.3 or higher. The application is perfect for two kind of users. First are professionals. With SubDivFormer engineers and designers will be enabled to work out the original image of the future products. The second category – amateurs, who will be able to use the application as an electronic designer or as a hobby. One of the developers tasks was to make the SubDivFormer interface so simple and intuitive, that even kind will be able to use it. For the young users the application can act as a «virtual plasticine», developing fine motor skills and spatial thinking. The developers plans to launch SubDivFormer version also for iOs, application for KOMPAS-3D, and in the future to release a separate desktop application for Windows.